How can I use awnings to make my business property more compelling? Are you searching for ways to make your property more compelling to consumers? Are you worried that the enhancement will be costly? You can make your property more attractive by have commercial awnings installed. Commercial awnings have historically brought more liveliness to streetscapes and assist business owners in more sales generation by adding extra commercial beautification. Beyond aesthetics, commercial awnings can also reduce business operational cost because the awning design can help with building climate control. How can commercial awnings assist with business climate control? Commercial awnings can protect your building from harsh UV rays while still shining through plenty of natural light into your business. What type of awning designs are available for commercial businesses? You can have custom commercial awnings installed for your business so you can have peace of mind that you have what you’ve been looking for. With high quality awnings you will never have to experience excessive heat gain, glare or expensive central air utility expenses again. Carroll Awning Company is here to create and install awnings that truly let your storefront sell your business professionalism. We can provide you custom window awnings, door awnings and other custom awning designs such as retractable awnings. 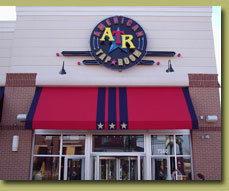 Our custom awnings are available to meet any type of configurations and business awning styles. We can customize the shape, size, framing and fabric of your commercial awnings with state-of-the-art awning technology . We can even offer you awning maintenance service. What are the benefits if awning maintenance? You’ll be able to increase the usability of your property because you’ll have the opportunity to use more of your outdoor living space. You will also have more control of your energy cost and usage. That means more money in your pocket and less solar gain.